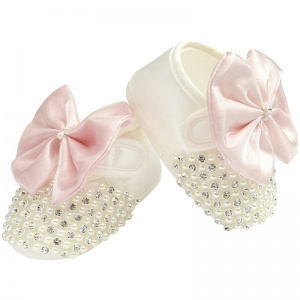 Baby girls ivory satin pink bow pram shoes with diamante & pearl, perfect for a christening, wedding or other special occasions. These beautiful baby girls ivory shoes are of a soft satin. They are decorated with twinkly diamantes & pearls to the full front of each shoe. A large shimmery pink bow sits on the velcro strap fastening. A cushioned soft & flexible sole provides comfort for pre-walkers. These shoes will beautifully compliment her christening dress or baby flower girl dress.